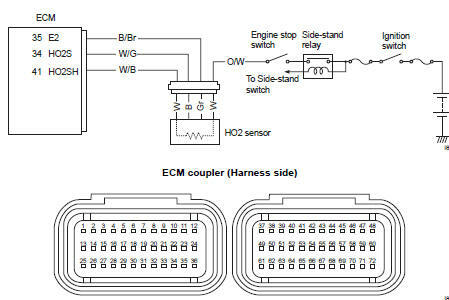 C44/P0130 Ho2 sensor output voltage is not input to ecm during engine operation and running condition. Ho2 sensor circuit is open or shorted to the power source. Heated circuit is open or shorted to ground. Battery voltage is not supply to the ho2 sensor. 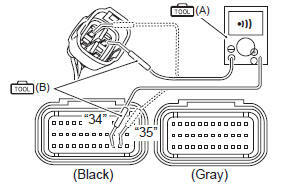 C44/P0135 The heater can not operate so that heater operation voltage is not supplied to the oxygen heater circuit. when using the multi-circuit tester, do not strongly touch the terminal of the ecm coupler with a needle pointed tester probe to prevent terminal damage. after repairing the trouble, clear the dtc using sds tool. Refer to “use of sds diagnosis reset procedures” . Lift and support the fuel tank. Refer to “fuel tank removal and installation” in section 1g . Check the ho2 sensor coupler (1) for loose or poor contacts. If ok, then check the ho2 sensor lead wire continuity. Disconnect the ho2 sensor coupler. Check the continuity between the w/g wire and o/w wire. If the sound is not heard from the tester, the circuit condition is ok. Disconnect the ecm coupler. Refer to “ecm removal and installation” in section 1c . Check the continuity between the w/g wire and terminal “34”. Also, check the continuity between the b/br wire and terminal “35”. Is the continuity ok? Go to step 2. W/g wire shorted to the power source, or w/g or b/br wire open. Connect the ecm coupler and ho2 sensor coupler. Warm up the engine enough. Insert the needle pointed probes to the lead wire coupler. Measure the ho2 sensor output voltage between the w/ g (b) wire and b/br (gr) wire, in idling condition. 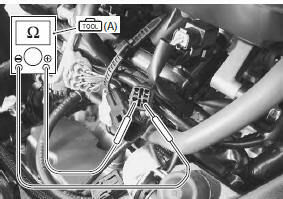 If ok, then remove the air cleaner box and pinch the pair hose (1) with a proper hose clamp. Measure the ho2 sensor output voltage while holding the engine speed at 5 000 r/min. W/g or b/br wire open or shorted to the power source, or poor “34” or “35” connection. If wire and connection are ok, intermittent trouble or faulty ecm. Recheck each terminal and wire harness for open circuit and poor connection. Replace the ecm with a known good one, and inspection it again. Refer to “ecm removal and installation” in section 1c . Replace the ho2 sensor with a new one. 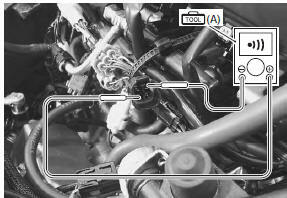 Refer to “ho2 sensor removal and installation” in section 1c . If ok, then measure the ho2 sensor resistance. Disconnect the ho2 sensor coupler and measure the resistance between terminals. temperature of the sensor affects resistance value largely. Make sure that the sensor heater is in atmospheric temperature. Is the resistance ok? Go to step 2. Replace the ho2 sensor with a new one. 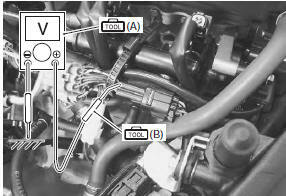 Connect the ho2 sensor coupler. 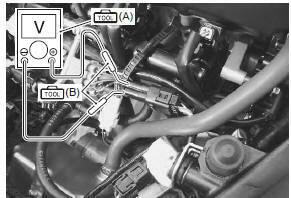 Turn the ignition switch on and measure the heater voltage between the w/b wire and ground. If the tester voltage indicates the battery voltage, it is good condition. battery voltage can be detected only before starting the engine. O/w or w/b wire open or shorted to ground, or poor “41” connection. Replace the ecm with a known good one, and inspect it again. Refer to “ecm removal and installation” in section 1c . Open or short circuit in the w/b wire or o/ w wire. Loose or poor contacts on the ecm coupler or ho2 sensor coupler.